@FAIRImmigration, founded by Dr. John Tanton, is a mouthpiece of white nationalist rhetoric. But it's more than that: it injects its foul ideology into actual policy. 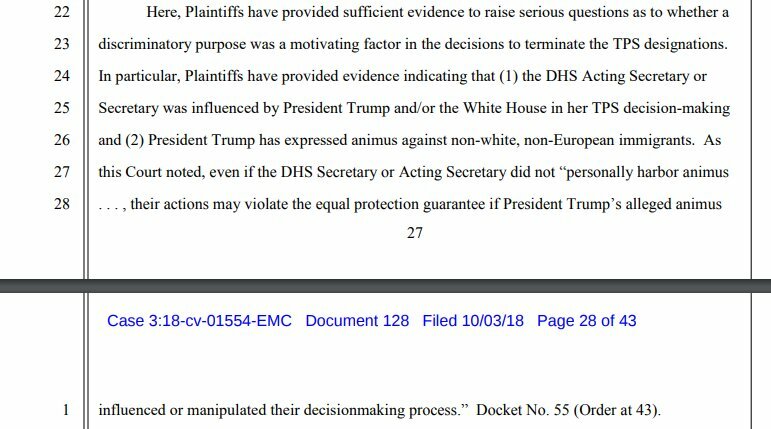 On p29 of the decision, the Court gives yet another example of Acting Secy Elaine Duke, who is supposed to make a dispassionate assessment of conditions on the ground in determining TPS eligibility, said "this conclusion [to end TPS] is the result of an America first view..."
Curious, because America was founded on ideals of welcoming the forcibly displaced. I'm not sure what "American first" has to do with terminating TPS. If the White House is influencing the decision, we have a problem, because the White House has made A LOT of racist statements.